At half past eight in the morning, we are at Munich Airport; at least that worked well from Augsburg, since my work colleague Stefan (thanks for that..) had brought us to the railway station almost at night. We take a part of the expedition baggage with us in order to distribute it to the different expeditions in Almaty. The rest will come by air cargo. This rest will keep us busy later, too. Started at 8.40, we arrive at Vienna in order to wait for the long distance flight to Almaty for five hours. After another six hours of flight and advancing the clock for five hours, we are in Almaty at two o'clock in the morning. From there, we are directly brought through the customs and put into a bus (including baggage) by the local trekking organization. A six hours drive brings us to the base camp Karkara, which - as we see now - is situated near the Kazakh-Kyrgyz border that we had passed on our Tien Shan trip in 1995. So we already know almost all of the route. 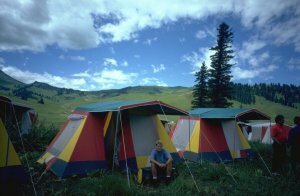 The base camp is similar to the other base camps in the former Soviet Union that we already visited: Two persons live in a house tent; the canteen offers breakfast, lunch and dinner. The first surprise for many of us are the milk noodles in the morning. The boss of the local trekking organization, Kazbek Valiev (by the way, the first Kazakh on the top of Mount Everest, 1982 - but one wouldn't assume that seeing him today...) takes care about logistics directly here. The first problem showing up is that the air cargo came with the same plane than we did, but customs clearance takes some days longer. That affects mainly us and the other Khan Tengri groups (in total 12 people), rather than the groups going to Marble Wall (10 people). Therefore, we will not have our equipment with us on the flight to the base camp which is scheduled for Sunday - and wait for stoves, tents and high camp food for some more days. 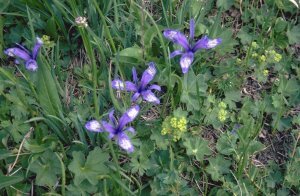 Our first small training trip to the mountain in the northeast of the camp almost gets out of control: We cross beautiful meadows full of flowers, growing higher and higher until they reach more than 1 1/2 meters. The mosquitoes are becoming more and more, too; in the steep slopes we hardly make any progress. After 1 3/4 hours the summit (2905 m) of "Blue flower mountain" (let's name it like that) is reached. Trying to make the descent on a more direct route leads us to steeper and steeper gullies with deep, wet and therefore beautifully slippery grass. So the descent takes about as long as the ascent. At least the weather becomes better in the afternoon. Also here we find huge amounts of Edelweiß. In the morning it is cloudless, but in the beginning very windy. Since we don't want to get another endless fight with the jungle, we only have a small walk in the morning to a nice lake in the north of the camp. The wind falls asleep at noon, as we do in the upcoming heat. At about five o'clock there's a short thunderstorm, and after that, from time to time some rain. In the evening another small walk valley-inwards, until the rain begins again. It rained almost the whole night, but the morning is sunny again. For breakfast, today we even get fried eggs - probably the last for some weeks. As announced at half past nine, we fly to the base camp Inylchek North. "We" - that is a four person group from Austria, a six person group from the Berchtesgaden region (Germany), and the two of us. During the forty minutes flight, the green landscape turns into a sea of glaciers and snow-covered summits. Over a 5000 m high ridge, we enter the spectacular Northern Inylchek valley with its huge glacier, arriving at the base camp (4200 m) where we are immediately received in perfect German by our interpreter Samat. No wonder - as we later hear, he had studied Germanistics in Germany for six years. Our "living room" view. Three thousand height meters to the top. 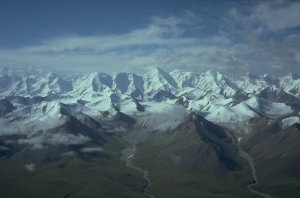 The view from the camp towards Khan Tengri is spectacular, however a little frightening. The mountain ridges limiting the valley to north and south are high and without any distinct passes, rising up steeply from the glacier. 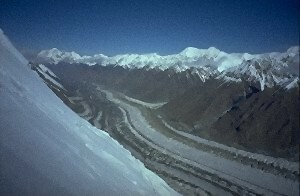 The base camp is situated on the glacier, close to its northern edge. 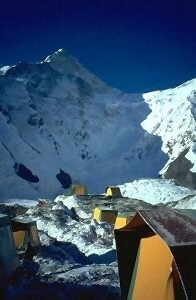 The tents - house tents like in Karkara - are standing on wooden platforms on ice and scree. The loo is built directly over a crevasse; there is a dining tent (where we get warm and good, sometimes [for us] a bit unusual meals three times a day), a radio station and an (outdoor, however) bar. The latter one is scarcely visited only: In the evening clouds come up, and there's about 5 cm of snow. In the tent, we are lying rather hard, as we took only the thin isolation mattresses for the base camp. We'll have to get used to it anyhow. At 8.30 we get breakfast (no milk noodles here); then quickly a second try to make the internet connection of the Bulgarian group work, in order to enable them to transfer their reports and images to their agency in Sofia. Unfortunately without success. Before leaving, we get a radio set. All groups which are on the way at the mountain have to talk to the base camp every day at 8.30, 14.30 and 17.30. At about ten o'clock we leave for camp 1. First for about an hour without bigger obstacles (only one a bit nasty crevasse) over the glacier towards the southern rim, then finally the way goes up. The route leads through snow flanks with some (however friendly) crevasses. Steeper parts are secured with fixed ropes. As we are the first ones today, we have to freshly break the snow-covered trail - a rather laborious task. After three hours we arrive at the "lower" camp 1, another half hour later at the "right" camp 1 at 4750 m altitude, on a small plateau on the ridge. There's only space for about 4-5 tents, and two are already here. An hour of building work in the scree, and our tent is standing, hopefully well for the next days. Having put in high camp sleeping back, isolation mattress and some other equipment stuff, we go down again. Meanwhile it's afternoon, and in the glacier creeks the water is higher, not allowing the same way back as we went this morning. So we have to make a big detour to the right, always up and down over small crevasses, hollows and creeks. But it takes only two hours to the base camp. Back there, we are welcomed with juice (compote) and soup. There's really no reason for complaint about the service. The weather was quite good during the day; downwards the valley (in the west) it looked gray, but it didn't come up to us. Only in the evening after seven o'clock some snowfall. News about the baggage: It is expected to arrive in the base camp the day after tomorrow. The weather is rather lousy today. Looks like a rest day - but we don't care, since high camp tents, stoves, and high camp food will (hopefully) anyway come tomorrow. So we hardly can do anything productive in the higher camps; at least a tent for camp 2 would be missing. Besides that, nobody is on the way, so we'd have to break the trail. We can find two (however, rather heavy) four person tents from the group of Peak Bayancol, which we can take, and there's also a Kazakh guide who is willing to take up the heavy load to camp 1. With a stove from the Bayancol group, warm clothes and some food for further above, we begin the walk to camp 1 in - as usually - not optimum weather. After having crossed the glacier, we come into very uncomfortable weather that approached from the west. Wind and snowfall. Only in camp 1, reached after 3 1/2 hours, it becomes better. The sun makes it nicely warm, soon letting us forget the cold and wet ascent. Two of our colleagues arrive in the afternoon, the other group of six stays in the lower camp 1, as there is more space down there. In the evening clouds come up again and it snows, but it is comfortably warm in the sleeping bag. It had snowed the whole night, but not much stayed until the morning, only some centimeters. But even during the day it doesn't want to stop. So our planned attempt to camp 2 will not take place today. Those two who tried it one day before got stuck in the deep snow. Now we would be ten people and surely enough to make the trail, but the trace would be lost in the snow immediately. So down to the base camp, all the way in the snowstorm. Obviously, one can not rely on the altimeter for weather forecast, the variations are quite small (up to +/- 30 m). But we can derive a first rule of thumb: If the air pressure rises, it will soon snow; if the pressure falls, it will soon snow dreadfully. An almost unknown shining disk is seen on a perfectly blue sky. Who had thought that yesterday? In the morning we can observe a sensational avalanche on the left side of Khan Tengri north face. Good that our way goes up on the right side over a safe spur. During the ascent to camp 1, the weather becomes hot and sweaty, but like the day before yesterday it takes 3 1/2 hours. Now we have enough equipment and food here, so there should be no need to go back to the base camp before the summit attempt. If everything works as scheduled, of course. The Swiss and a Japanese group started this morning from camp 1 towards camp 2. 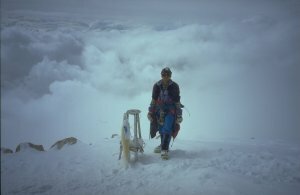 At half past two they are at 5300 m; they have to make a trace through a lot of snow. It the weather keeps, we could profit on that tomorrow. Departure for camp 2. Fortunately with not as heavy loads as originally planned. Our Kazakh mountain guide Jurij carries three tents for us (i.e. the twelve Summit Club participants) up to camp 2. So we can divide ours to several people, and everyone has to carry only one part. This morning, there are even no clouds at all, we can start at 7.45 in the sun. Soon it becomes warm, though actually it is still about -7°C. The route follows a crest, and it is continuously secured by fixed ropes, where one has to pull up with considerable force at some places. Mostly, the terrain is about 40° steep, some ice-covered rock steps are vertical (would be III if dry). Fortunately Jurij is leading and makes a trail out of the snow-covered something. Over long distances, the snow hasn't settled at all, the steps don't last. Without the fixed ropes it would be hardly possible, or at least very dangerous. After about 5 hours we reach camp 2 on a wide glacier plain, 5500 m high. One of the tents is immediately put up; after two hours the rest of our colleagues arrives, having departed later and with more baggage, as they already want to stay overnight here. We, however, go back down to camp 1, since we have only half of the stuff at camp 2 that'd be necessary for the summit, and we believe it might be better for our acclimatization. (go high, sleep down). The way down is quite exhausting because the fixed ropes are often under such a tension that one cannot rappel easily. And rappelling (or how one likes to name the way we proceed downwards in a hopefully secure way) has its effect on our power and especially our backs. So we are quite exhausted as we arrive in camp 1 after two hours. Correspondingly, we will change our plans and not do this way again tomorrow, but have a rest day in the base camp. This night, it hasn't snowed at all. Nevertheless, we are too exhausted for a summit attempt at the moment. After 1 3/4 hours we arrive in the base camp, very thirsty. A beautiful sunny day that can easily be spent sitting in front of the tent. In the afternoon layer clouds and a little cooler. The basecamp is situated at the foot of Pik Bayankol, about in the middle. This morning we hear strange regular "whoof" sounds around our tent. Looking outside, that becomes clear: The other tent inhabitants try to shake the snow from the top of the tents by knocking from inside. Ten centimeters of snow in the base camp, and it constantly snows and snows. That will become a rest day. Suddenly it becomes lighter, and within half an hour all the clouds have disappeared - it is warm and sunny like yesterday. In the morning, Robert and Wolf from the Austrian team fly out to Karkara because of health problems. After Hans (from the Berchtesgaden group) had begun the trip home already four days ago, we are only nine people in total now. We take off to camp 1 only after lunch, because the trace is snow-covered, and we don't want to dig the trench into the snow as we are only two. So we let the English precede, they are (hopefully) fresh as they are here in Inylchek only three days. And, there is hope that the food becomes better again. The last two days it was quite lousy, obviously the cook went to Karkara. Today she was said to have been seen in the base camp, and voilà, lunch is good again. We leave directly after lunch, unfortunately without having the English in front of us (they apparently prefer staying in the base camp). At least, there are three other people in front to take the trailbreaking work. Yesterday's avalanches have wrecked the trace in the middle portion, there is only avalanche debris or areas cleared down to the bare ice. This time we need three hours to camp 1. That's clear, because the rucksacks are empty except for some indispensable luxury articles (2 beer, 3 liters of Coke, 1 liter of Fanta etc.). The weather: during the day fine with a bit a milky sky; in the evening cloudy, and the usual snowfall follows. A rather short attempt this morning shows us that there is no reasonable chance for us to get up through the deep snow to camp 2. Those three people who have spent the night in the snow cave nearby, leave rather late, and they only want to look up a bit for acclimatization. For tomorrow, we expect the Swiss to come up, and then there are enough people for making the trace. Meanwhile, we are resting in the sun until it slowly becomes cloudy. Again a cloudless morning. Around eight o'clock we set off for camp 2, first on somewhat reasonable trace, later we have to plod through the snow. The trace that was made yesterday is completely snow-drifted. Fortunately, one of the Swiss comes along and makes the last seventy meters. The camp is reached after 5 3/4 hours, quite exhausted. But in the comfort of the tent, we quickly recover. In the afternoon, Ulrike from South Africa and two Russians/Kazakh come from camp 2, having made the summit yesterday. According to them, it takes 15 hours from camp 3 to the summit round trip. 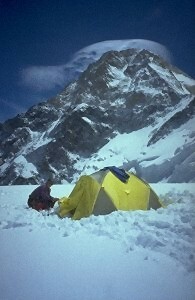 All of the Japanese, however, also use camp 4 on the ridge at 6400 m, where surely there is not a lot of space. But that seems not to bother the Japanese in general. The much more annoying thing might be that camp 4 is a very cold spot - the sun comes only around eleven o'clock. And sleeping at that height might also not be too good. Thanks to the South Africans' rich food planning, we could stay here not only six days, but probably six weeks. Ulrike has brought what they don't need anymore. For supper, therefore we have Sauce Bolognaise with Parmesan cheese on crispbread. The English who have come up from camp 1 today, are crowding around the one tent that has been carried up for them. Apparently there were some misunderstandings with the porters. A place with a nice view (of course, to Khan Tengri) in camp 2. In the evening it's severely snowing. We'll see if we can go to camp 3 tomorrow. The so-to-say most cloudless day at all. After a night completely without altitude problems, we set off for camp 3. 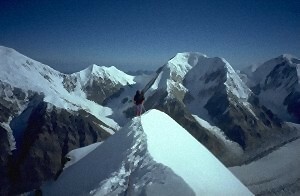 To get there, we have to pass over the northern summit of Peak Chapaev, being technically a little demanding. Everything is secured with fixed ropes, but climbing in icy III rock with a heavy rucksack is not trivial anyway. So already at the first steep portion we are sitting in a Japanese traffic jam, costing at least 20 minutes. After that we climb steep snow/scree slopes, until we reach a rather difficult little gully. I avoid the climbing and directly climb up at a Prusik in addition to the Jumar, but that shows to be quite exhausting - being at almost 6000 m altitude. The snow slopes to the northern summit is also quite an effort. Arriving on the top after 4 1/2 hours (for 600 height meters), we can enjoy a beautiful view. 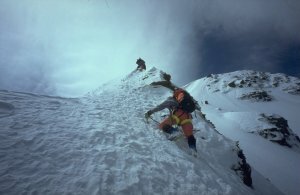 To reach camp 3, we have to descend 300 height meters through the deep snow along the ridge, keeping a respectful distance to the huge cornices overhanging to the north. We move to the snow cave together with Polish Jacek and Arkadij, a Russian Guide. Not too many more people should arrive now, four persons can just well live here. While one could easily walk around outside in camp 2, here in camp 3 it is mostly windy. And there is hardly any space in front of the cave, since it is dug into a steep slope. The air in the snow cave is about -2 to -4°C, the floor is quite somewhat colder. In the morning at three o'clock the sky is clear, as our exploration of the outside world shows. That is not too easy because the entrance is always filled with snow by the wind. At half past four, pale stars are still visible, in the west above Peak Chapaev it looks black. We wait a bit with our deciding for the summit attempt. At half past six, Arkadij judges the weather to be good, and we join him and Jacek, leaving at about eight o'clock. That seems to be about the usual time for the local guides here. At least for those who have no headlight. The ascent first follows the flat ridge, the Japanese were so friendly to have already made a trace here. Later it goes up the rock ridge, mostly on the right side of the edge through snow and rocks, continuously secured by fixed ropes. Some of those might have seen better days: If a rope is scrubbed through, the remaining parts are connected with a knot. Therefore, some parts become shorter and shorter and give less chance to choose one's route at difficult portions. Moreover, that gives knots preferentially at the rock edges, preventing quick rappeling. The weather is sometimes better, sometimes worse, but around noon clearly showing a tendency to the bad side. Since quite a while, it is storming and snowing as Jacek comes from above at 6400 m, and we also turn back shortly after (after 4 1/2 hours). Exactly there we meet a Georgian from Tbilissi ascending, obviously asking everybody about the time. He is already quite breathless, but he goes on. The gymnastics at the fixed ropes takes quite a lot of time, and the almost horizontal snow ridge appears now very lengthy, as the trace has disappeared. At half past two we are back in the snow cave. The rest of the afternoon is filled well with preparing food and resting. Seeing the disgusting weather outside, toward evening a question rises: Where is Arkadij? As we can hear by radio, he reached the summit at six o'clock, but at ten it will become dark, and he has no light with him. We are almost relieved as at ten o'clock there's some noise outside - but it is the Georgian who comes in, having turned back at 6800 m. He has no sleeping back, and no friends who would search him. As exhausted as he is, he probably doesn't even know his own name. After he went out to search, Jacek comes back at midnight together with a very exhausted Arkadij. In the morning at three o'clock an increadibly perfect starry sky. The clean air at our altitude makes one see so many stars that no constellations show up any more. Let us dare another attempt for the summit. 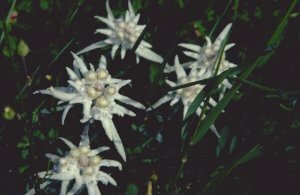 Completely dressed, at five o'clock we see pale stars and impenetrable black behind Peak Chapel, some snow flakes stagger through the air. So the weather will become like yesterday - back to bed, go on sleeping. The Georgian's friends - of course he did have some - rush in reproachfully, since he simply disappeared in someone else's snow cave without telling them. Right, what would for example Jacek have said if Arkadij had spent a nice evening in the Japanese tent while he was searching outside in the storm? At eight o'clock in the morning it is almost cloudless. So far about even short term "weather forecasts". Now anyway it is too late, and we don't have enough supplies for another day up here. And, our attempt yesterday might have very much attacked our power. Questionable, if we had had a realistic chance today. Withdrawal to the base camp. That's easy to say, but: Peak Chapaev North is in our way, almost 300 height meters without a trace. 2 1/2 hours to the summit, then 1 1/2 hours of fixed rope gym to camp 2 where we deposit everything of importance for the high camps (isolation mattress, sleeping bag, warm clothes). Meanwhile snowfall and sun are alternating. Two hours down to camp 1 (depositing our ice axes) along the tightened ropes where rappelling often doesn't work well, and another hour down to the edge of northern Inylchek glacier (depositing the crampons). Now only 45 minutes to cross the glacier, and after that the big attack against the beverage stock. Meanwhile it is snowing almost all the time. The next Summit Club groups arrived today. By the way, their expedition baggage is also got stuck at the customs in Almaty. The Swiss - unlike us - departed at five o'clock, reaching the summit in 10 hours. Not the perfect summit weather, but not as bad as it had been the day before. During the usual morning radio connection (we listen also in the base camp in order to be informed about the situation higher up) we hear that one of the Swiss in camp 3 had got problems yesterday during the descent. Probably HAPE, and after the night he is in rather bad condition. Instead of getting a Certec chamber brought up by the helicopter and then a terrestrial rescue, the Swiss can achieve that the person is directly taken by the helicopter on the saddle, 5800 m high. It takes several approaches of the helicopter; this height is close to the limit for the helicopter, and a proper landing is already impossible there. Later we hear that this was the first direct rescue at all from up there. Our seven colleagues have "chosen" the very best weather for their summit day today. Five out of them reach Khan Tengri from camp 3 after 9 hours. Only in the evening clouds come up. We have bathing day today - on advance order, warm water is available in the washing tent. Today the guided Summit Club group arrived, but without guide. He is working in Almaty to get the baggage out of the customs. Breakfast consists of porridge or something similar. We didn't' get milk noodles in the base camp Inylchek. Besides, there is bread and jam, for which a knife would be nice to have (often not on the table). Those who like the Russian customs can take the sardines in oil. We drink black tea, one jug with the concentrated tea, and another jug with water to dilute it. Lunch begins with a soup containing a combination of meat pieces, potatoes, buckwheat, vegetables or whatever was left from the preceding day. The main course is something similar without soup. The most outstanding ability of the cook is to never let the guests see any piece of meat bigger than a cubic centimeter. As the soup, too, the second course is very spicy. Besides, there is salad - grated carrots with lots of garlic, tomatoes and cucumber, green salad in small stripes with spicy sauce. Sometimes there's a dessert like plums, watermelon, or chocolate cream. The beverage is stewed fruit (thick juice). Dinner is very similar to lunch, except the soup is missing and there is tea again. Those who are not enthusiastic about that, have to stick to the plate with cookies and sweets that always is on the table. And who doesn't like tea can buy "real" beverages: a liter of juice, Fanta or Coke for US$ 2, a can of beer for US$ 3. In the afternoon, our colleagues come down from camp 3, now throwing around such unnecessary things like crampons. In the evening, they celebrate the summit victory with the camp staff with considerable amounts of beer and vodka (as it is usual here). To be on the safe side, we join this celebration - who knows if we'll have something to celebrate later on. Again heavily loaded with everything we could get in the bar, we are on our way up, towards a hopefully more successful summit attempt. We originally planned to get to camp 2, because except of some bottles of Coke we have almost nothing in our baggage. Unfortunately there is again no trace to camp 2, and we didn't recover as well as we hoped to the last two days. So today's trip ends at camp 1. A diarrhea suddenly coming up supports this decision. And the weather is not very cooperative: The morning began with sun on a hazy sky, now we only see a bright spot. Fortunately our colleagues that have arrived last Sunday already have equipment in camp 1, so they can lend us sleeping bags and isolation mattresses (they'll stay here tomorrow). Our own stuff is up in camp 2. I don't get rid of the impression that guided expeditions recruit their participants out of people who don't know how to set up a tent. Or that at least the impression shall arise that one is the ideal participant with these abilities? The weather is similar to yesterday, even a little worse: Already at noon the sky is completely covered, and it snows. Exactly at the most difficult spot from camp 1 to camp 2 the English come rappelling from above - 20 minutes waiting. Five hours to camp 2; except for us, there are only two Dutch, and a Japanese comes 1 1/2 hours after us and move into his "tent" with about a square meter of area, which further is reduced during the snowfall of the following night. The last night was a bit restless, because Claudia's digestion was revolting. My diarrhea of yesterday became quiet. All in all, not the best conditions for the way to camp 3. The weather, on the other hand, looks quite good: After it had snowed the whole night, now the clouds are below us, and the sun is shining. Well, let's have a look. Already three people in front of us who relieve us of the tiresome topic of the trace. The way to Peak Chapaev North appears very long today, and being on the top, we are at the end of our power. But we have to go down to the snow cave, taking another hour. Without us, however, the other two remaining colleagues (one had turned back) would have stayed in the narrow and crowded Kyrgyz snow caves; they had not found our cave. So we spend the evening with Japanese Katori and Dutch Hank. As could be expected, we are too weak to try the summit today. Katori has a headache, so Hank goes alone. We have a rest day meanwhile, but that doesn't mean only lying around lazily - eating and drinking much is obligatory. There are certain problems about the food: Liverwurst is in eatable consistency only after a longer stay in the sleeping bag, and the tuna can must be made icefree in the water bath for half an hour. And it always takes half an hour until the snow has become boiling water. But we also find interesting things in the supplies that had been left here by Jacek and Arkadij. For example, a very good salami from Yekaterinburg. In the afternoon two Italians arrive, they squeeze in at our side - the cave becomes quite narrow. At 7.20 pm Hank is back, he had quite nice weather, but had to do the trace for the whole way. That is quite a lot of work in the summit region. The early morning view out of the cave gives the usual result: Not a weather that could be expected to become good. But our beverage stock wouldn't stand another rest day. At least it is not snowing as we leave the cave at seven o'clock. Our baggage consists of a bottle of Coke (in a small "rucksack" on the back), a thermos with tea (fixed by its belts), muesli bars, sweets and other equipment squeezed into the pockets of the down jacket. Altogether we are five people (the two Italians, Katori, and the two of us), and from the south two Russians are joining us. Beginning the traverse, still 450 m to the summit. Clearly visible the couloir above the rock step. 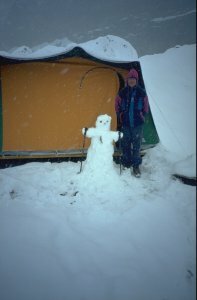 In moderate weather - sometimes it snows - we need 3 3/4 hours to camp 4. 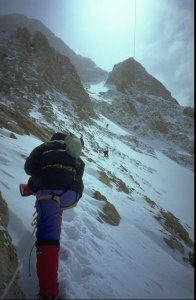 The route follows the ridge also above camp 4 for almost 200 height meters, then it makes a traverse to the right, and over a short steep cliff (10 meters II in perfect rock) one reaches a funnel-shaped quite steep snow couloir. But that all is no problem since it is secured with fixed ropes, it only becomes exhausting. Meanwhile the cloud layer is below us, it is very warm and sunny. The end of the couloir is at about 6700 m altitude. From here a very doubtful fixed rope leads up a rock step, above which we enter another snow slope which slowly reduces its inclination. 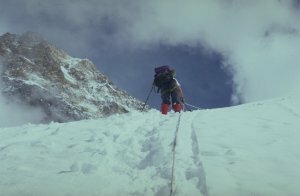 Here the rest of the ascent becomes very tiresome, the time to the summit is hard to estimate, since one simply doesn't know where the top is. After the slope and a short snow crest, there is rock again, and suddenly the mountain is finished. There we find the surveying mark 6995 m - on the highest rock, and the cornice aside rises up to the given height of 7010 m.
The surveying sign at 6995 m, with the horse hair the Bulgarians have brought up some days ago. At 5 p.m. the summit is reached, the last part a torture, breathing 5-10 times for each step, and my altitude cough also contributes nicely. 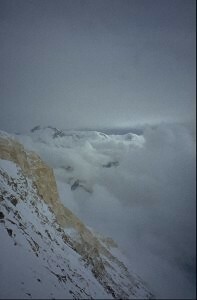 The most smaller mountains have disappeared in the clouds below us, and higher up the clouds also become denser. The view between these two cloud layers goes far and is - though there are no other mountains - very impressive. The only mountain still visible in the clouds is Peak Pobeda. 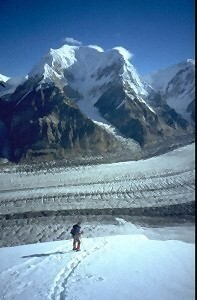 In the foreground Khan Tengri's marble ridge. In the summit area it is windy and cold (but in fact surely not below -15°C), especially as the higher clouds cover the sun. So we stay only a short time. Already at the uppermost fixed rope it is warmer and comfortable. Down the most ropes one can rappel, along some of the damaged ones climbing down is more appropriate. Often the knots prevent a fluent rappel. Our Japanese colleague climbs down everything from the top on, probably in a wrong estimate of the time that would be needed for the 1200 meters. Especially due to the lack of concentration that comes up after a ten hour ascent, rappelling is not only faster, but also safer. I join Katori for the rest of the way, while Claudia goes ahead to camp 3. Despite the increased speed now, we come into darkness, together with the usual snowfall. At 10 p.m. we reach the last rope, and now we only have to make the long way along the snow crest. The lamp that was fixed by Claudia at the point where we have to turn right to the cave is an important help under these conditions. At 11.10 pm we are back in the cave, and the first action is drinking and drinking. Hunger is not an issue until toward the morning. The night was short, narrow and somehow we didn't recover well. One is hungry, but somehow doesn't want to eat, is exhausted but somehow can't sleep well. At half past seven we begin cleaning up and having "breakfast". Katori makes another rest day; we begin our way back to the base camp at 10 a.m. A very arduous way, it still snows and the trace to Peak Chapaev North has once again almost completely disappeared. 3.20 hours for the 300 height meters through a white nothing. Rappelling to camp 2 works well, except for the avalanches. In camp 2 we meet Walter (from one of the "newer" Summit Club groups), who welcomes us with tea and is bored to death here because the camp is completely abandoned except for him, and he has nothing to read. His colleague Christoph had already started upwards one day earlier and is busy at the summit today. The way from camp 2 to camp 1 is very uncomfortable. In the upper section, a hard layer under completely unstable powder snow, further down a hard deep groove where crampons are necessary - but it is warm, so always the snow keeps sticking to the shoes - one has to beat it away for every step. In camp 1 we take the tent and are back at Inylchek glacier at quarter to seven, where another deposited rucksack (fortunately empty) is waiting for us. At 7.40 pm we arrive in the base camp, only minutes before arrival of a snow/rain front. Finally again apple juice and beer. A Summit Club trekking group will be flown out to Karkara today, so we also are departing from Inylchek in a rush. Meanwhile the helicopter flights are not as frequent as in the beginning when there were several transports a day. Within an hour all our baggage is packed together, and we fly along the endless Northern Inylchek Glacier and to the northwest over glaciers, then over this strange green stuff that is called "grass" in the outside world, to Karkara - where it is raining. Now we only must somehow get a flight back earlier than we had booked (26 August). Kazbek is not very optimistic and talks about 20 places overbooking at Austrian Airlines. But we think we don't really need a two weeks stay in Karkara. After 3 1/2 weeks we finally can enjoy a real shower in Karkara. Here down in the warm, the smell that one has accumulated at the mountain becomes noticeable, much more than in the cold camp Inylchek. For lunch, there is meat in real pieces (optically visible sizes). Also for the trip to Almaty we join the trekking group. We yesterday already learned to pack everything together quickly. The trekking group had, by the way, basically done the trail which we had done by helicopter inwards. The bus goes at 9.30 am; the only interruptions are a lunch break at a gorge in a nice landscape and a bursted tire in not such a nice landscape. The two radar controls on the road are for the opposite direction, and our driver anyway adheres to the regulations. At three o'clock we are in Almaty. Travel guide Yermek can soon tell us that on Friday there really are places for us to Vienna. We quickly ran to the AUA office and fixed these places, paying a fine of $ 100 since we had a ticket with fixed date. The rest of the afternoon, we look around a bit in the city. As the city map that we found in the hotel room is in Rumanian (and from Soviet times still), not everything is completely clear. Hotel Otrar, where we are accommodated seems to be one of the best in town; we especially enjoy the dinner buffet. 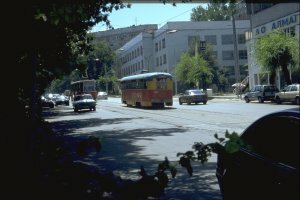 The yellow-red tramway fossile can be heard over a pretty long distance. 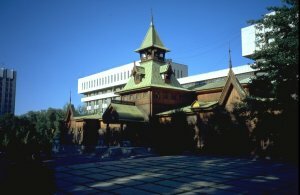 Almaty, wooden church in the park in the city center. We undertake a city tour with the group who (so-to-say) has "adopted" us. From the mountain Kok-Tyube, there is a nice view over the town, and we also see how close to the town the four and five thousand meter peaks of Zailijskij Alatau are situated. After that we visit the Kazakh national museum; lunch in one of the "street cafés", a great deal of which meanwhile exist (Shashlik, meat salad - without any digestion consequences); in the afternoon a bit of shopping in the bazar which is very orderly and clean, unlike the impression of the word "bazar" maybe for European ears. Noticeable, too: Everywhere drinks like Coke, Fanta or beer are available. Peculiar that there are only Dutch beers (Holsten, Heineken or Bavaria). Getting up early today: At 1 a.m. the bus brings us to the airport. Check-in and customs take some time, but without complications. At four the plane to Vienna starts (almost full up), and we arrive there at 6 a.m. local lime. Now another hour to Munich, and soon we'll be back home. Samat, interpreter in the base camp Inylchek, always understood and solved our little problems, as far as they were solvable at all. Thanks to the canteen team in the base camp Inylchek north we had a time without any major digestion problems, always well fed, during which we always were looking forward to come back from the high camps to the warm meals in the canteen. Jurij was a big help on trailbreaking and has impressed us a lot by his almost endless power. Thanks to Jacek we could fall back on extensive food supplies in camp 3, as well as from Ulrike from South Africa. The two other Summit Club groups traveling with us proved to be very good comrades, who also were very cooperative about the equipment in the high camps. We thank the "Gipsy Team" for the asylum in tent and sleeping bag in camp 1, when our stuff was one camp further up. We very much appreciate our spontaneous "adoption" by Günter Kämpfe and his Summit Club trekking group. Yermek, the local guide of the Summit Club trekking group, could very quickly organize out flight back, a thing we hadn't dared to hope for before.